Today I'd like to introduce a new Premium feature we've added for subscribing users: Private Trade Mode. While Cardsphere has been designed from the ground up as a negotiation-free platform, negotiation still happens. Most of the time the negotiation takes place on our Discord server or in person, particularly for high value cards or cards which have been agreed to sell "in a bundle." 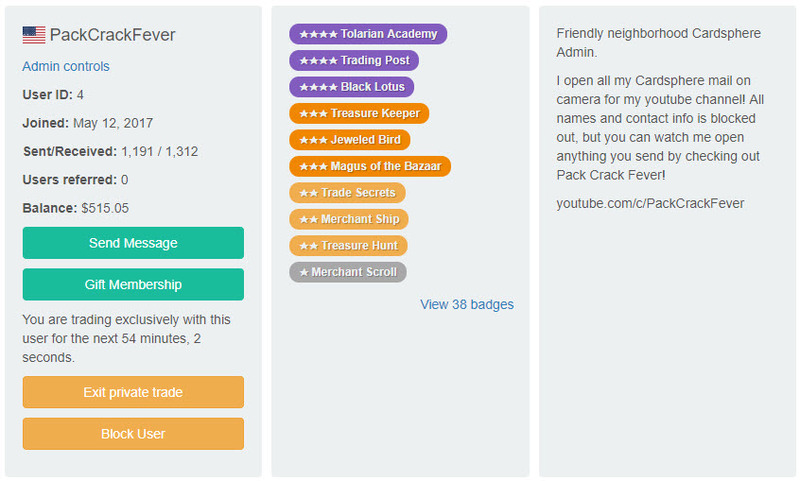 Cardsphere's push market previously complicated this type of deal, because other users could snipe the offers out from under the intended user. In the case of very valuable cards, loading extra funds in your account forced receivers to pause their other Wants or risk the balance being consumed by other committed trades. Once you've arrange a deal with someone and want to privately trade with them, visit their profile page and click the Trade Privately button. A dialog pops up that lets you choose how long your account will stay in Private Trade Mode. While you are trading privately only your selected trade partner can initiate trades with you. They may continue to trade with other users normally. 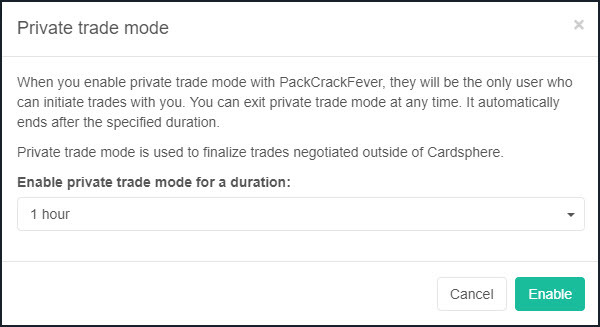 Once you have entered Private Trade Mode, you will see a reminder icon by your account menu. 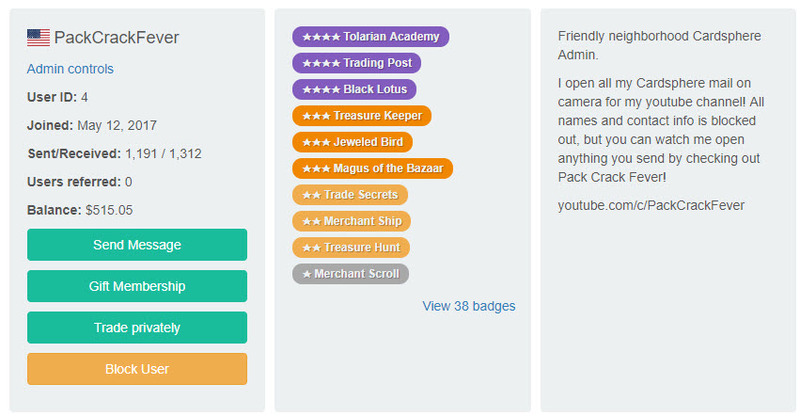 Your trade partner's profile page shows for how long before Private Trade Mode ends automatically, calculated each time you refresh the page. Click Exit Private Trade to resume normal trading. You will also see the timer and a button to exit private trading on your own profile page. We hope you find this new addition valuable. As always, we're happy to discuss ongoing development in our subreddit or Discord servers. Another challenging What's the Play from Lord Tupperware, Ethan Saks. This time around, the cards laid out are from the outgoing MTGO cube. 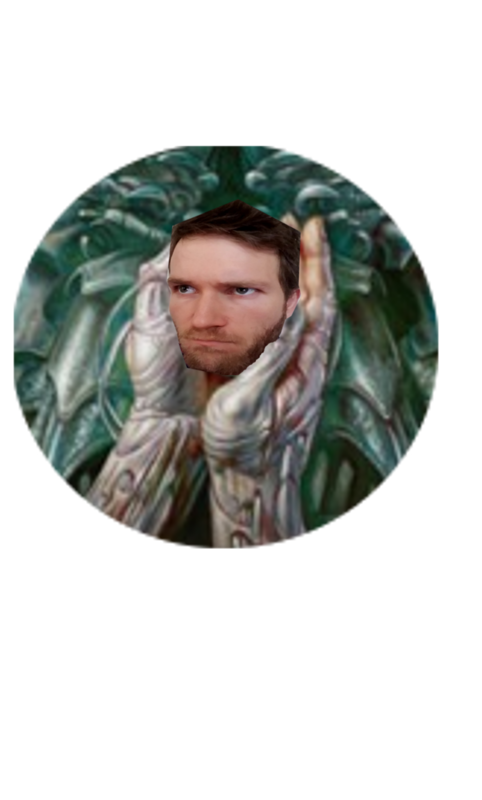 What happens when you introduce Pteramander to Delver of Secrets? Andrew from Tier Fun lets you know in this edition of the Search for Spice!